The new generation trade agreements, such as the TPP (Trans-Pacific Partnership) and TTIP (Transatlantic Trade and Investment Partnership), have changed the ground and context of trade negotiations through extension of negotiations further to national policies and regulation. These new generation trade agreements have gained criticism not only from activists, but also from international and US economists (Krugman 2015, Summers 2015, Stiglitz 2015). “Aligning EU and US standards and regulations would mean exporters in other countries would only have to comply with one set of rules instead of two. This would make it easier for them to export and would help their economies. The current engagement with negotiations thus implies a road paved with opportunities and win-win options, yet it seems that many of the claims would require further elaboration. Furthermore, they do not seem to really hold, when what is actually negotiated is put under scrutiny. In other words, while there may be many lofty aspirations of what is to be achieved, what is negotiated is what counts. The problem of comparing EU- South Korea FTA with potential benefits from TTIP is of course that it does not compare like with like as trade negotiations with US exceed in breadth what has been agreed with EU-South Korea agreement. Change is also dependent on situation before and after as well as how particular markets are shaped. It is also clear that realization of some aspects of what was negotiated with EU- South Korea agreement, for example, in the pharmaceutical annex, will be more problematic in the context of negotiations of TTIP. The likelihood of EU-Korea and the US-Korea agreements to be used as basis for further negotiations has already drawn attention from the European Consumer Organisation (BEUC 2015). While the rationality of achieving common regulatory practices for the benefits of trade are emphasized, it is not made clear how the scope and requirements for regulation are affected and how a stronger role of multinational industries can affect policy space for health both at European and national and local level role in domestic regulation. Promises of not lowering current standards are not sufficient, when what matters is how and on what basis new standards can be set and new regulation can take place. Furthermore, through constraining the process of standard-setting and establishing new requirements for regulatory process, the negotiations do have implications for regulatory policy space, even if it would not directly restrict or explicitly deny a possibility for higher level of standards. The purpose and role of regulatory council envisaged as part of negotiations may also have different implications to the Parties. There already exists a relatively strong centrally based presence of regulatory affairs in United States (Office of Information and Regulatory Affairs, OIRA) making this more easily negotiable for USA. The idea of oversight on regulatory initiative across Atlantic may be appealing to many industries, but may look different from the perspective of Member States. In many areas industries are no longer local and interests promoted at EU level will be similar to those in USA. Yet, it is clear that common regulatory process and requirement standards set under influence of multinational actors can be against public interest and the interests of citizens of European Union Member States and citizens of United States, while still making it easier and more beneficial for multinational industries to trade across countries. The win-win for global corporate interests can become a “lose-lose” for public health and public interest. We do need to question why we should negotiate all public policy and regulatory issues under trade agreements, where agenda is more easily dominated by interests of multinational corporations and coalitions of export industries, when there are other forums for international cooperation. Trade policy should not be the only show in town. We have United Nations specialized agencies involved with health and food safety. It is perfectly possible to seek closer transatlantic cooperation through other means than trade agreements. If improving regulatory frameworks is the aim of the game, then why are we seeking this through the most difficult route, where corporate interests, in particular, dominate? Another explanation is that what is understood as improvement actually considers improvements for corporate beneficiaries or trade. The Union shall seek to develop relations and build partnerships with third countries, and international, regional or global organisations which share the principles referred to in the first subparagraph. It shall promote multilateral solutions to common problems, in particular in the framework of the United Nations and international law. The challenge is that if TTIP negotiations really represent the democratic values we wish to uphold, it is clear there is a problem in terms of how these democratic values are currently understood, delivered and respected as part of the negotiation process. United States has not ratified more than two of the eight ILO standards (ILO 2015). According to ITUC (International Trade Union Confederation) report South Korea is known to have ratified only four of the ILO core labour standards, which do not include right to form Unions and strike (ITUC 2012). The list of common values promoted by the TTIP seem to lack human rights, equity and solidarity – or perhaps it has been implicitly recognised, that TTIP is not a vehicle to support human rights, equity and solidarity. If we focus on global governance and the role of European Union, it is possible to argue that current commercial policies are not fully in line with principles and objectives of the European Union external policies. The aim to feed rest of the world standards and regulatory cooperation practices agreed between European Union and United States does not fit well with external policy priorities on multilateral cooperation. It is also unclear how negotiations of TTIP and in particular on investment protection and trade secrets relate to promotion of democracy or consideration of TTIP as a vehicle for promotion of democracy globally. Regulatory cooperation under TTIP can perhaps be best described as a process seeking to establish procedural framework on how governments can regulate. As these procedures make regulation more burdensome and allow stronger engagement of stakeholders and the other negotiation Party, it is likely to hamper the scope of regulatory measures that governments can take. Lack of regulation has human and societal costs. What provides benefits for investors and corporations, does not automatically lead to benefits for all, but can imply substantial costs for society at large. The 119 billion € estimated economic benefits of TTIP after ten years on the basis of the Centre for Economic Policy Research (CEPR 2013) assessment are comparable to, although lower than, estimated annual social costs of alcohol, which have been estimated as 156 billion € (Rehm and Shield 2012). Endocrine disruptive chemicals have been estimated to result in attributable costs of similar annual magnitude to the expected benefits of the TTIP in European Union (Trasande et al. 2015). The costs of lack of regulation and regulatory action can thus be substantial both in terms of monetary and human costs. The additional requirements and bureaucracy also imply costs for public authorities if they wish to uphold capacity for regulatory action. While negotiators keep on emphasizing that existing regulatory levels will be upheld, the more cumbersome and more requiring future regulation is made, the harder it will be to enact new regulatory measures. It is also not clear how TTIP relates to revision of existing regulations and standards. This is particularly important to consider if European Unions’ REFIT (Regulatory Fitness) measures, which will open up and reassess regulatory measures in future as then revision of these new regulations, could be affected by new requirements set as part of TTIP negotiations. As we are told the importance of growth and the TTIP a crucial means for new growth, it is also necessary to ensure that what is negotiated does not result in “cold growth” accumulating in tax havens with increasing social inequalities, declining public funds, strengthening of the position of multinational industries and corporate monopolies, worsening terms of employment, increasing vulnerability to financial crises, more complex public bureaucratic requirements, and regulatory and public policy impotence. Enhancing innovation and pharmaceutical policy in the public interest? A particular case of point needs to be made with respect to pharmaceuticals. It is necessary to ask what public benefits will an even greater influence of global pharmaceutical industry bring to the market approval and reimbursement process of new pharmaceuticals? It has already been shown that corporate influence can play an influential role in reimbursement decisions in Europe (van Herk et al. 2013). While the formal focus on pharmaceuticals and TTIP has been on policies with respect to generics and imports from third countries, the real cost pressures for national health systems come from new medicines. High prices of new medicines in both United States and European Union have led to legitimate concerns over the longer term sustainability, affordability and added clinical value of the new medicines, priced at the level that markets can bear. Yet the TTIP negotiation seem to focus on making it harder for the public administrations to intervene or influence pricing of medicines, while empowering the pharmaceutical industry to maintain and strengthen the current regulatory context and position of major multinational players. Furthermore, from health policy priorities perspective, the more systemic danger of TTIP is that it could hinder necessary change of corporate profiteering and an already failing model for innovation and R&D towards pharmaceutical policy in the public interest. It is reasonable to assume, that what has been negotiated under Trans-Pacific Partnership (TPP) will emerge to the agenda of the TTIP negotiations. We can thus form some understanding of issues at table from what has been negotiated on the basis of the leaked pharmaceuticals annex of the TPP (TPP 2015). While United States representatives have denied that the transparency annex could be subject to investment protection claims (Weisman 2015), this would be surprising as procedural fairness, which is the aim of the very chapter, provides a feasible route for claims. The relationship between requirements for procedural fairness and what is considered as fair and equitable treatment may also be closer than assumed. Indeed, European Commission explanatory note on investment protection uses these interchangeably: “Protection against unfair and inequitable treatment – e.g. denying basic procedural fairness “(European Commission 2013, p. 4). While it may be understandable that producers might seek to ensure the best treatment for their products in other countries, it is not sufficiently recognised that TTIP negotiations can have substantial implications to the ways in which medicines are approved to markets and reimbursed, in particular, within European Union. Furthermore, while “transparency” seems to be sought in the reimbursement process, there are due concerns over implications of transparency directive to progress in access to data on clinical trials in Europe , which has been criticised by American research-based pharmaceutical industry in their 2014 submission to USTR 301 trade review (PhRMA/USTR 2014). Public health groups and researchers have already drawn concern over definition of trade secrets as part of the transparency directive and links to TTIP negotiations (HAI ym. 2015). Transparency should also not imply a shift towards legitimizing direct-to-consumer advertising in Europe as the TPP transparency chapter seems to seek legitimising more broad-based direct-to-consumer advertising through the internet (TPP 2015). The danger of the TTIP is that it becomes a protective shield for corporate benefits against duly and timely efforts to change public policies in limiting markets, when commercialization of services becomes too costly, when public interests and opinion do not support profiteering in health services or favour non-profit organizations or public provision (e.g. in publicly funded services), or in the case of pharmaceuticals, using competition to lower prices. Furthermore, while TTIP is likely to bring growth to the multinational pharmaceutical industry, it is less certain that this will result in taxable income, innovation or cost-effective clinical benefits to patients. On the other hand we can be relatively confident that if exclusivities for pharmaceuticals are expanded or lengthened as result of the negotiations, this is likely to take place at the cost of public purse and those ill, not only within Europe and United States, but as well globally. We need to be clear that when “high standards” are discussed this does not only apply to investment and intellectual property rights as it is also important to recognise that trade negotiations can lead to transatlantic sinking of new safety standards, while protecting and tightening those which serve particular interests. What is good for European Union exporters and industry may not necessarily be safe or great for consumers. Are health services as “safe” as is claimed ? TTIP is a negotiated treaty and has its focus on where political priorities are set. It is clear, that while there have been statements on public services (European Commission 2015), this has not so far resulted in explicit exclusions of these services from negotiations. Legitimate concerns over health, education and social services seem to have become dealt with by separate statements and promises, which are likely to be forgotten, when the final agreement has been signed. We know that it is entirely possible to establish clauses and articles excluding services and sectors or declining to negotiate on investment protection. It is thus a matter of political choice whither we accept health and social security exclusions to remain aspirational and vulnerable to interpretation or explicit “hard” priorities representing European values on what is to be traded and what is not. It is also likely that other chapters under negotiation, such as government procurement, competition, subsidies or state owned enterprises will have relevance to how publicly financed services can operate and whither these can compete against commercial providers. There is a danger that trade negotiators may implicitly consider government and public services role as a residual function, where there are no commercial interests. Trade agreements may also impede European problems as internal market rules and regulations may be considered as a starting point for negotiations with third countries. This applies not only to health services, but as well how services of general economic interest and general interest are understood. The problems emerge if public funding and role for health care provision is pushed to a residual function and required not to affect markets, then excluding publicly funded health services just means excluding services for which there are no commercial interests or which are not tradable. One concern in relation to the TTIP is the emphasis on general rules and priorities across all sectors. This is reflected in the regulatory chapter on general principles which seeks to build on previous OECD guidance (EU/TTIP 2015). The shift towards a more general application of rules applies also to TISA (Trade in Services Agreement) negotiations on services on which the TTIP builds, where a push seems again to be from specific commitments to more horizontal obligations (TISA 2015). European Union and Singapore FTA investment chapter expands national treatment obligations for investment to all sectors, including health, social and educational services, with the exception of audiovisual services and procurement for governmental purposes (EU-SSFTA 2014). It may thus be expected that European Commission will seek to expand this horizontal inclusion of national treatment of existing investors in all services also to TTIP. This is not about trade, it is about regulation of national policies. This has relevance with respect to the role and position of non-profit providers and can affect how services of general interest and general economic interest are treated in service provision as a government may wish to treat these differently from commercially driven multinational corporations, which can provide “like services”. The application of restrictions to performance requirements could limit means to ensure continuity of care, equity in access to services or to ensure efficient use of resources within the health system. Health services or national exclusions on health services from trade agreements are not necessarily as “safe” as we have been told, if exclusions only apply to ability to restrict new establishments, while governance of national policies and investment has slipped further under trade agreements. The paradox of the TTIP negotiations is that an international legal framework limiting public policy options and policy space for health is negotiated with very limited evidence on broader societal benefits, while this very framework will not only require increasing and more narrowly defined evidence for future regulatory measures to take place, but can also make it more difficult to gain evidence for public policies and regulation for health. It is clear that costs from TTIP have not been addressed fully in terms of investment protection, lack of regulatory action, regulatory burden for governments or increased costs for new medicines and technologies. Even broader financial sustainability issues may be at stake in the context of financial services chapter, including social security systems or vulnerability to new financial crises. The legal language introduces new terminology and obligations, which may not be fully understood in terms of implications as this type of requirements may not have been dealt with as part of health policy-making and governance. While consultations have provided managed information and sharing of European Union stances to the wider public and academic research, which is an improvement, the consolidated negotiation texts are still available only to chosen few. The focus on transparency may seem a move to the right direction, but measures promoted under transparency seem to go only to one direction. There is a danger of creating a transparency ratchet, where all that is on public sector remains open and accessible to early scrutiny by corporations, while at the same time access to information for regulatory purposes from the corporate sector becomes safeguarded by stronger protection of trade secrets. A major challenge with respect to “evidence” relates to precautionary principle. It is also clear that impact assessments have shifted to serve more commercial needs with proposals of regulatory and trade impact assessments (EU/TTIP 2015). A reaffirmed commitment to OECD good regulatory practices is to be made as part of the agreement (OECD 2012), which raises also questions of purpose and role of the regulatory cooperation focus. If OECD already provides soft guidance on regulatory cooperation, the TTIP can’t be about “soft” guidance, but seems to be much more about locking in a framework for regulatory cooperation and enforcement through TTIP. Furthermore, if the agreement is a “living agreement”, the initial negotiation round will need to be only a placement for further negotiations. If TTIP is the answer, then what is the problem? It is possible to argue that trade should preferably be negotiated under multilateral governance with a broad participation and actual transparency, rather than making a bilateral deals and then imposing them to all others, which does not sound as great foreign policy or respect for democratic accountability. Governments can deregulate without a broader international framework and if TTIP partnership is only about “encouraging” regulatory cooperation, then perhaps this encouraging could be done in a less legally binding form under OECD. Most of health promotion legislation has not taken place as result of international agreements, but as result of governments following wise regulatory measures of other governments. As world has not ended in spite of corporate predictions, other governments have dared to follow the lead. However, the TTIP fits perhaps too well with an aim to ensure that there is less scope for innovative regulatory measures for the benefit of public health policies through the imposition of a more restrictive overarching regulatory framework, enhancing investor and intellectual property rights protection, and enabling early corporate presence as part of the regulatory process. Do trade policies then really suffer from lack of empowerment of multinational industries and insufficient consideration of corporate and transnational investor interests as part of public policy-making and regulatory decisions in European Union and United States? Do we really need to have consultations across Atlantic or a regulatory council on potential regulatory interests in case these might affect trade interests? Why should framework for health-related standard-setting and regulation be decided under closed trade negotiations between United States and European Union? The pass of the fast track vote in USA implies that more scrutiny and oversight is now required from the European Union side and, in particular, from the European Parliament. The process of the European Parliament vote was not promising. If a closer partnership is to be desired, then any advancement of regulatory cooperation with respect to pharmaceuticals, health promotion, health, environmental protection and safety should best take place elsewhere, than under trade or corporate friendly regulatory councils governed under trade and economic policy priorities. Innovative solutions could be sought on the basis of public health and health policy priorities and has been done. The point is not about international cooperation, it is about where, on what basis and for what purpose this cooperation takes place. *Meri Koivusalo is a senior researcher in National Institute for Health and Welfare in Finland. She is a medical doctor with a PhD in public health and MSc in environmental health policy. 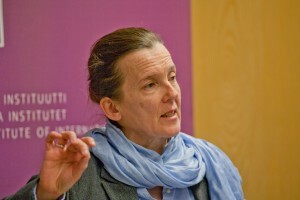 She has written and published on international and European health policies, including on trade and health. She has followed trade policy developments for more than 15 years. She has served as an advisor for Finnish Ministry of Social Affairs and Health as well as for European Commission DGV, DG VIII and WHO. She was a member of the WHO Consultative expert group on research and development: financing and coordination (CEWG).